Dentures are removable dental appliances created to replace missing teeth. Dentures can be either complete or partial. Complete dentures replace all of your teeth while partial dentures replace teeth missing along an arch. 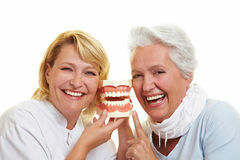 We also provide implant supported dentures. Dentures provide support for any existing teeth and allow for full dental capabilities, such as chewing and even bringing back your smile. Lang’s Dental Center will work with you to create a custom set of teeth, restoring your dental functionality, improving speech and bringing your smile back to life.